Do you have a few of those recipes…you know…the “special” ones that you make only at Christmas time? Well, I have a recipe that I’ve been making for close to 30 years now. Actually, let me correct that. I used to make it, until I was diagnosed with Celiac disease 13 years ago. 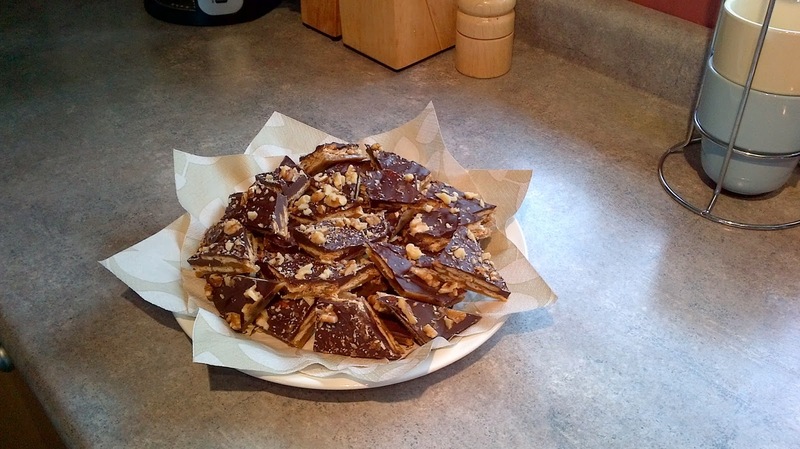 The recipe is for Breton Brittle and I found it in the Company’s Coming for Christmas recipe book. It’s made with Breton crackers. 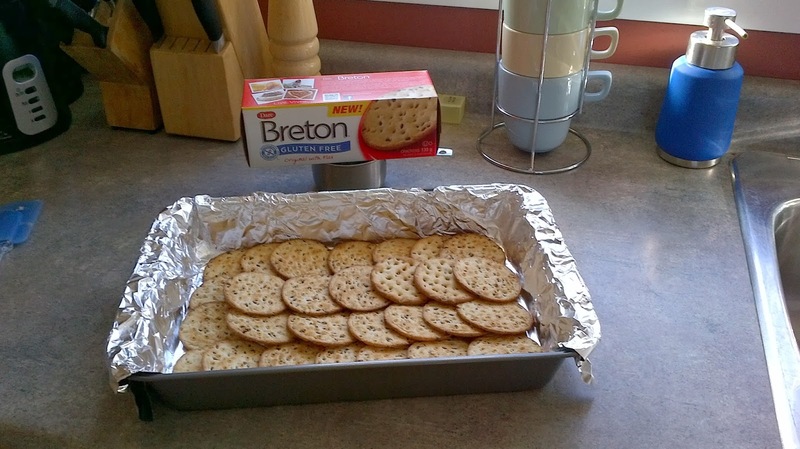 As we all know there was no such thing as gluten-free Breton crackers…until NOW! They finally came out with gluten-free Breton crackers and they are wonderful! Of course, I scoured the city until I found some and rushed home to see if they would work in my recipe. I tried the recipe and it tastes just like I remember it did 13 years ago! It was fabulous! 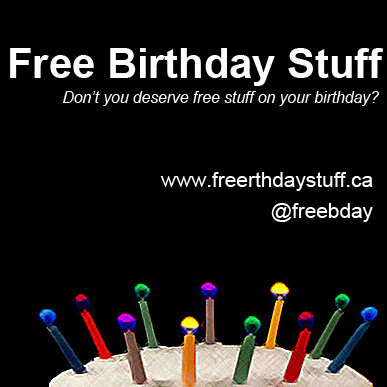 First, you line a 9 x 13 cake pan with aluminum foil. Then overlap the crackers to completely cover the bottom, using 4 crackers across and 7 crackers lengthwise. Combine 1 cup of brown sugar and 1 cup of butter in a saucepan, stirring constantly until it comes to a boil. Carefully pour the mixture over the crackers. Bake at 400°F for 5 minutes. Remove the pan from the oven and immediately scatter a small bag of chocolate chips over the top. Let stand for a few minutes, until softened. Spread the chocolate evenly over the crackers and sprinkle with chopped walnuts or almonds. Now comes the hardest part - waiting for it to cool! I usually put mine in the refrigerator. 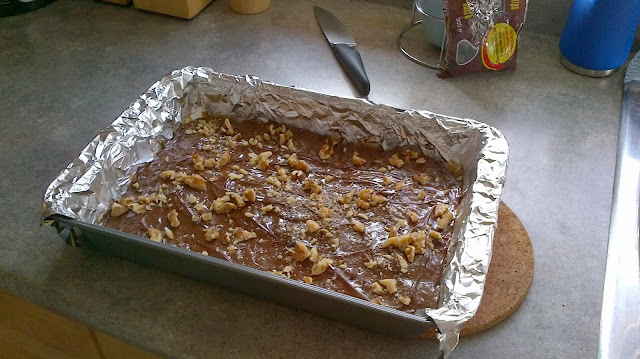 Once it has cooled and hardened, just break it into pieces like you would any brittle. Voila! 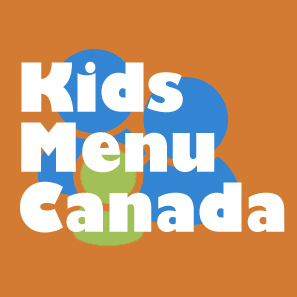 A fabulous treat that everyone will enjoy! Did you see Dempsters is now coming out with a Gluten Free bread? Just found breton crackers at Walmart and only $1.44 a box!!!! (Walmart on 127 Street). They taste great and it is nice that they are the same price as normal crackers. Rice crackers, puffed rice, corn flakes and rice crisps, quinoa flakes, kashi, marry gone cracker brittle even would be great! I just tried the Dufflet version of this and they used puffed rice and almonds. or maybe try one of those silicone dishes,those are great too. I think this recipe would be great with some salted rice crackers, so you get extra crunchy crackers and sweet and salty in one dessert!! !